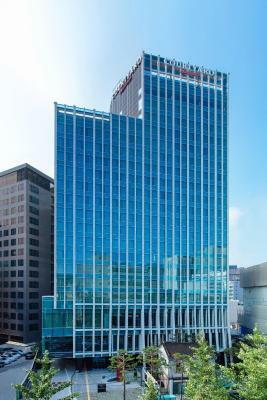 Lock in a great price for Courtyard by Marriott Seoul Namdaemun - rated 8.8 by recent guests. Although centrally situated the hotel was quiet and peaceful. The staff were, without exception courteous, helpful & polite. The restaurant buffet was great as was the MoMo cafe. Love everything about the hotel. Big spacious rooms. Hotel staffs are extremely helpful and well mannered. Location was the best, close to food, shopping, attractions, public transport. Best of all, they have coin laundrette facilities which makes traveling with kids so much better! I will definitely be back if I visit Seoul again. The hotel has a great location and rooms are very comfortable. I felt so lucky to choose it , because I booked another hotel at the beginning of my trip where I couldn’t stay in for 1 night. Very clean rooms and bathrooms. 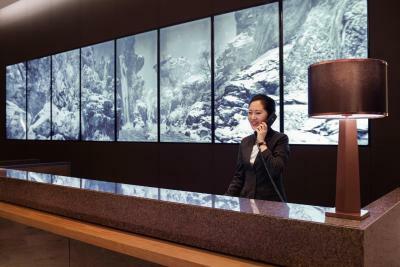 Helpful and friendly staff from the concierge to the housekeeping. I ate all of my meals outside to try the variety of cafes and resturants in Seoul. Breakfast was okay. I hope there would be more variety. 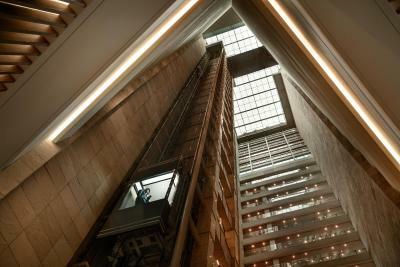 I had a great stay - the staff went above and beyond to make my stay as easy as possible. A big thanks to Bob at concierge who booked me into a fantastic tour to the DMZ. The room was really spacious and the bed super comfortable. I upgraded to have executive lounge access and this was a great place for me to work in the evenings, and the breakfast was just what I needed. Thanks for having me! Good location. Staff were helpful. Price looks bit expensive but for a business trip worth it. The staff was friendly and went above and beyond to make my stay enjoyable. My room wasn’t ready at check in, but I was given a free welcome drink as well as a late check out time for any inconvenience. The hotel is beautiful and very well taken care of. 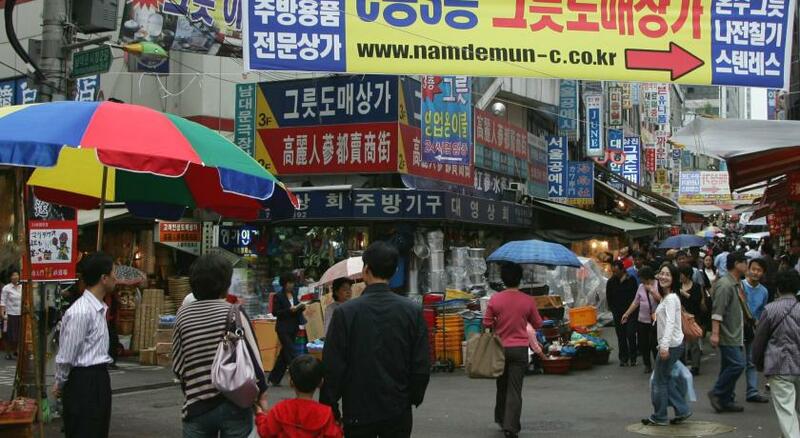 The location is ideal for walking around Seoul. I will definitely stay here again! Very good hotel / very central for sightseeing and perfectly equipped. Spacious room and nice view. 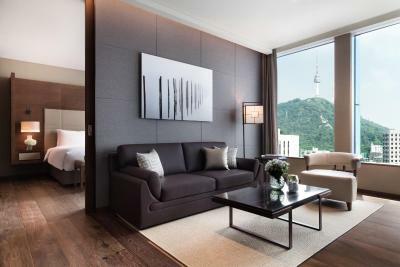 One of our top picks in Seoul.Courtyard by Marriott Seoul Namdaemun is situated 700 yards from Seoul Train Station (Line 1, 4 and KTX) and within 450 yards from Hoehyeon (Line 4) and City Hall (Line 1 and 2) subway stations. 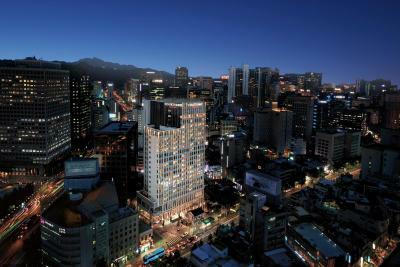 The lively Namdaemun Market and Myeongdong shopping district are within a 5-minute walk from this hotel. All of 409 guest rooms and suites are equipped with a 49-inch flat-screen TV, high-speed internet and a spacious working area. All rooms have sweeping city views. 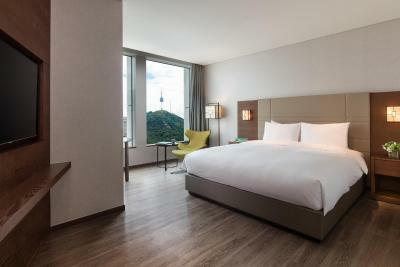 Selected rooms boast the views of Namdaemun Gate, Korea’s first national treasure. 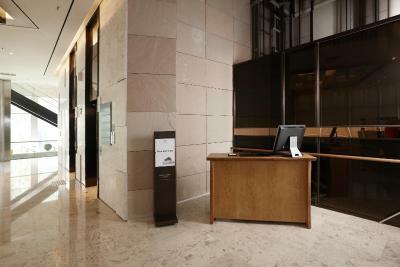 Staying guests can freely access the 24-hour fitness centre. 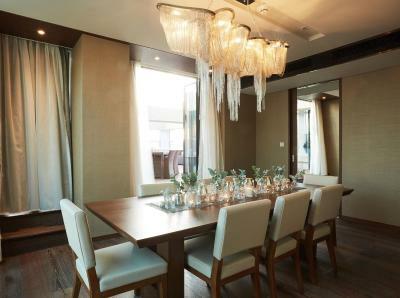 The meeting and banquet facilities here can accommodate up to 150 guests at a time. 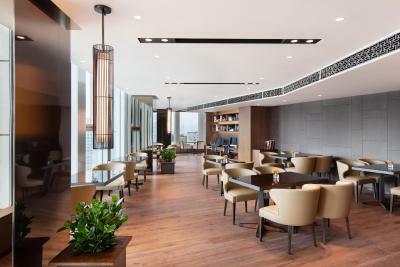 All-day dining is available at Momo Café, while drinks and snacks are served at MoMo Lounge & Bar. 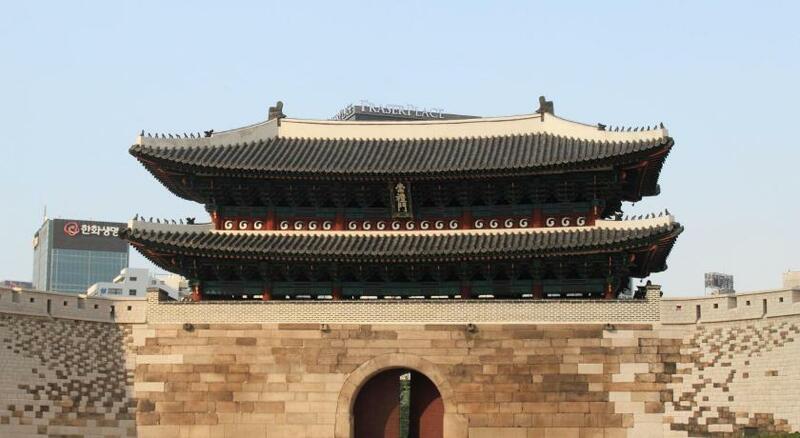 From Courtyard by Marriott Seoul Namdaemun, the charming Insadong Culture Street and the historical Gyeongbokgung Palace are within a 10-minute drive. Incheon International Airport is an hour’s drive west. 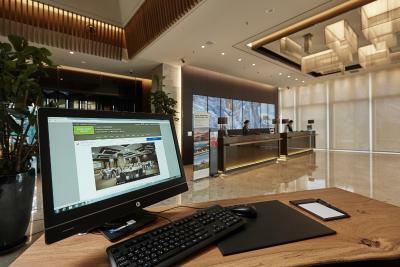 Courtyard by Marriott Seoul Namdaemun has been welcoming Booking.com guests since 22 Apr 2016. 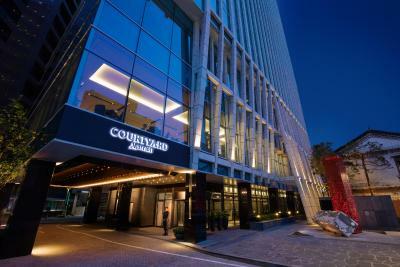 When would you like to stay at Courtyard by Marriott Seoul Namdaemun? Premier guest rooms include plush bedding, a flat-screen satellite TV and spacious working desk. Please note that rollaway beds cannot be provided in this room type. This room features a lounge area with a flat-screen TV, work desk and ergonomic chair. Executive deluxe room features a lounge area, flat-screen TV, work desk and ergonomic chair. The spacious executive suite features a lounge area, flat-screen TV, work desk and ergonomic chair. 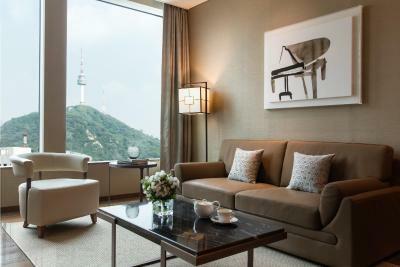 Guests can enjoy refreshing views of Namsan Tower and Namdaemun Gate. This room includes plush bedding, a flat-screen satellite TV and spacious working desk. This room features a lounge area with a flat-screen TV and a work desk. This double room has a soundproofing, minibar and sofa. 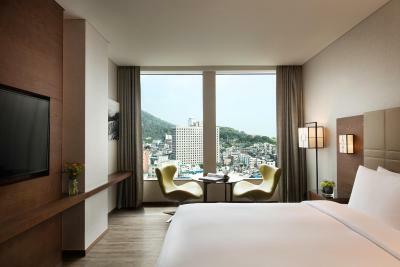 Experience the modern and cultural vibe of Seoul at Courtyard Seoul Namdaemun, the first Courtyard branded hotel located in the heart of the historic, cultural, business district of Namdaemun. 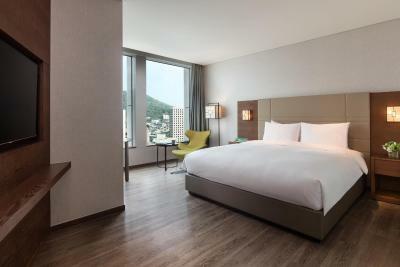 Whatever your travel purposes are, Courtyard Seoul Namdaemun is your perfect home away from home for both business and leisure travelers. 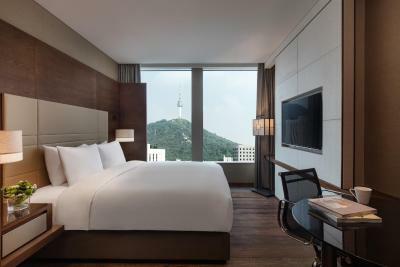 Be fully cozy and productive at the same time in one of our 409 guest rooms and suites equipped with comfortable duvet and bedding, spacious workspaces, 49 inch flat-screen TV, high-speed Internet access and stunning views overlooking the country’s national treasure no.1 Namdaemun Gate. All in-room guests can have complimentary access to the 24-hour fitness center. 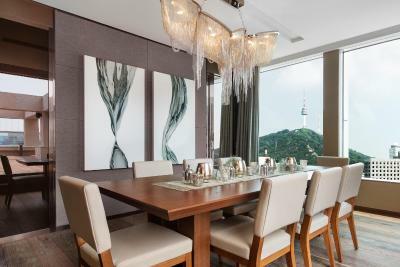 Be sure to stop by the all-day dining restaurant MoMo Café for a delicious meal or visit MoMo Lounge & Bar for a casual drink during your time in Seoul. 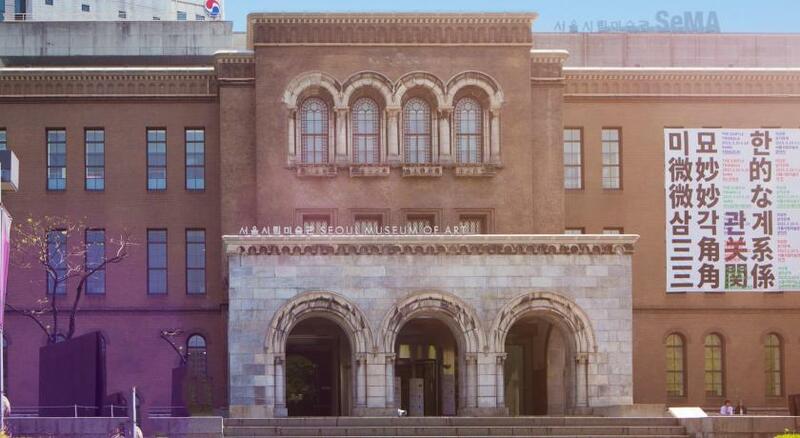 If you have plans to host an event, our meeting spaces accommodating up to 150 guests is the ideal venue located in the heart of Seoul. House rules Courtyard by Marriott Seoul Namdaemun takes special requests - add in the next step! Courtyard by Marriott Seoul Namdaemun accepts these cards and reserves the right to temporarily hold an amount prior to arrival. Please note that the Executive Lounge access is limited for children under 12. Nothing - it provided everything that it said it would. There was nothing that did not please me. I liked the breakfast, and how there was an offer of the noodle station. The room service and cleaning was also great and the staff at the hotel were extremely nice. The quality of the toothbrushes they provide in the bathroom. The best concierge ever! Extremely helpful and welcoming!! No complaints! This was an ideal place to see some of the city highlights and rest up on a long layover. Fantastic location, with an airport limousine bus stop just across this street. This made it logistically simple to fit in some great site seeing, without stressing about catching my flight back. The staff were brilliant. 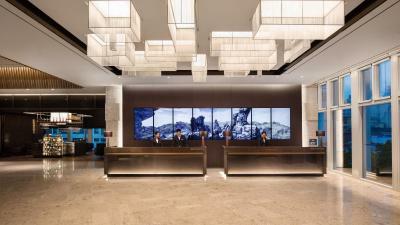 I was so impressed with the Duty manager Erica Ryu she went above and bejond with service. What a wonderful lady and so kind and super efficient she helped me recover my purse left in a taxi. Thank you Erica. Very friendly and accommodating staff, lovely clean rooms and great breakfast. Right near great markets, shopping and palaces. Second time staying and honestly wouldn’t want to stay anywhere else while in Seoul!